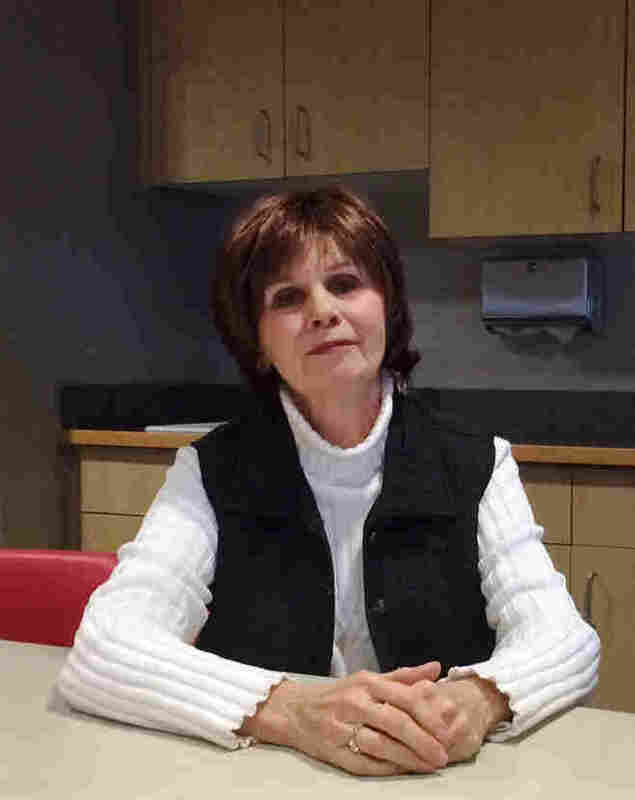 Big Bills A Hidden Side Effect Of Cancer Treatment : Shots - Health News Cancer treatment is increasingly expensive, even for patients who have insurance. Some doctors advocate discussing the costs of cancer treatment as they would hair loss, pain or other side effects. 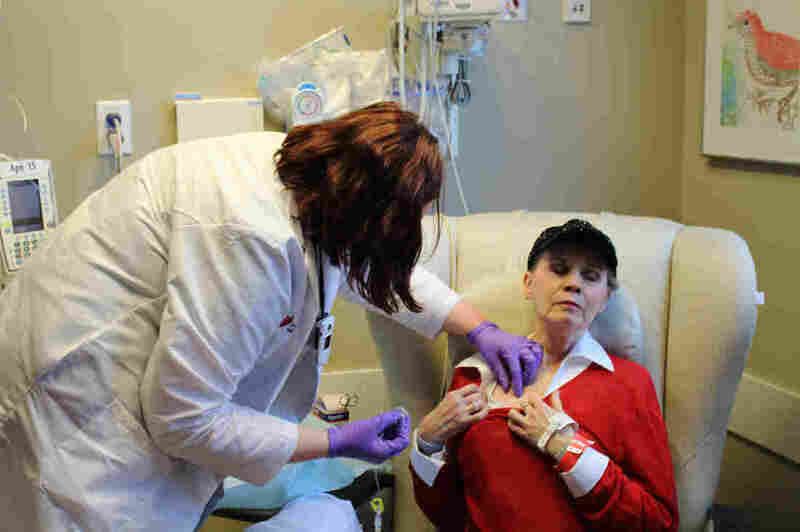 Anne Koller closes her eyes as an oncology nurse attaches a line for chemotherapy to a port in her chest. Koller typically spends three to six hours getting each treatment. Anne Koller was diagnosed with late-stage colon cancer in 2011 and has been fighting it since. But it's not just the cancer she's fighting. It's the bills. "We went from drugs that cost a few hundred dollars for a course of therapy that might be a month or six months or a year, to drugs that were costing $10,000 a month." "Think of those old horror flicks," she says. "The swamp creature ... comes out and is kind of oozy, and it oozes over everything." When she was able to work, Koller, who just turned 65, was in the corporate world and safely middle-class, with health insurance and plenty of savings. At first, she was too sick to deal with the bills. They piled up. "You start looking at these bills," Koller says, "and, as much as you know it's expensive, the shock itself is like, 'What?' "
Anne Koller was diagnosed with stage 3 colon cancer in 2011. She has been fighting cancer and the medical bills ever since. Her response was to begin asking her doctors about the cost of the treatments they recommended. Middle-income patients are feeling the weight of that financial burden more than ever, says Dr. Neal Meropol, an oncologist at University Hospitals in Cleveland. He took over Koller's care a couple of years ago. "Patients are weighing this in their calculus now," Meropol says. High-deductible health plans and soaring drug prices are to blame, he says, and a sea change happened when a new generation of drug therapies got FDA approval for treatment in the late 1990s. "We went from drugs that cost a few hundred dollars for a course of therapy that might be a month or six months or a year, to drugs that were costing $10,000 a month," Meropol says. Total cost of cancer care in the U.S. is projected to reach more than $150 billion by 2020, according to the National Cancer Institute. The U.S. Centers for Disease Control and Prevention released a study last year that found that, compared with people without a cancer diagnosis, cancer survivors are less likely to work and more likely to struggle financially. Another study, out of Washington state, found that the longer a cancer patient survived, the higher the rate of bankruptcy. University of Chicago's Dr. Jonas de Souza argues that it's time for oncologists to begin considering the financial consequences as a real side effect of cancer care. "We talk about hair loss," de Souza says. "We talk about numbness and tingling in the hands and feet. We talk about, 'This chemotherapy will cause low blood counts.' Right. Should we also be talking about, 'Well, this chemotherapy is expensive'?" He and Meropol are part of a growing field of researchers studying the impact of costs for cancer patients. Koller will tell you cancer does cause financial stress. How Much Does Cancer Cost Us? "Here's what happens," Koller says. "I was talking about that swamp thing ... but you know, OK, you go to collections. You end up with a court thing. I had been talking to the hospital, asking for help — nothing, nothing. Finally, they went to a sliding payment scale." Her credit is ruined. So she's driving an old car. Small expenses, like an Internet connection, are out of the question. And there are other challenges. "Socially, things change a lot," she says. "You talk to people and, if you dare, say, 'God, you know, I can't afford this,' for instance." Or, " 'Let's go out to lunch,' on the day you can eat. You ... think twice about it." Koller says she wishes more financial information had been given earlier in her treatments. She is now using the very last of her savings to pay the bills — and, still, some are going unpaid. This story is part of NPR's reporting partnership with WCPN and Kaiser Health News.